Do you live in a house whose surfaces catch dust really quickly? And you have to wipe them every single day? 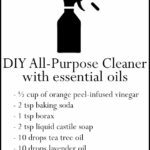 Then you NEED this DIY essential oil dusting spray! What is a Dusting Spray? Dusting spray is simply a solution used to clean dusty surfaces. It contains cleansing ingredients that easily remove dust, polish the surface and keeping it looking shiny. 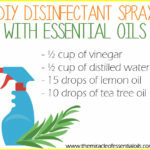 If you add essential oils, it becomes an essential oil dusting spray and has lots of added benefits! 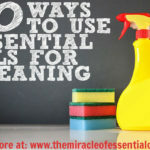 For example, it makes your surfaces look squeaky clean and shinier, has powerful antimicrobial, antiseptic and antibacterial properties and leaves a beautiful scent lingering around! Okay, let’s get into the ingredients we shall be using for this DIY essential oil dusting spray! Distilled water – This is the base ingredients in the dusting spray. Water is cleansing and removes dust and dirt. It’s important to use distilled water because this type is totally pure, making it impossible for mold and bacteria to grow in it. If you use filtered water, then you have to keep your dusting spray refrigerated. Liquid castile soap – Castile soap is a natural plant-based soap that’s ideal for green cleaning. It lifts off dirt, grime and stains from surfaces. It is great for scrubbing for layers of dust that can’t seem to be wiped off with water and a cloth alone. 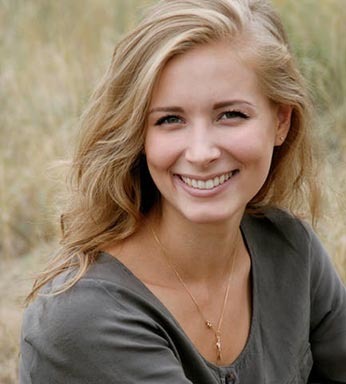 Olive oil – Choose a moisturizing oil to make your surfaces look shiny and conditioned. This is especially good for wooden surfaces. You may choose another oil of choice but olive oil is easily available and probably already in your house right now. 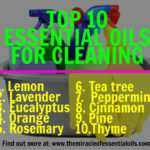 Lemon oil – One of my fav smelling oils, lemon is a popular choice for green cleaning. 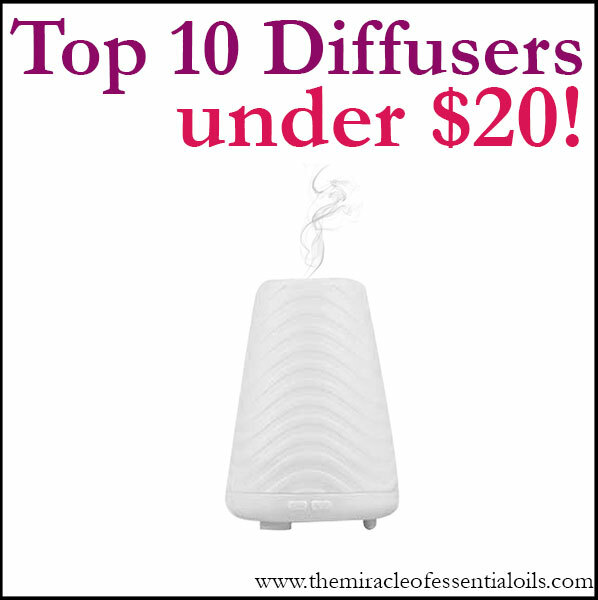 It smells clean, fresh and citrusy and its scent lingers on the surfaces you use it on. It also makes surfaces shine. 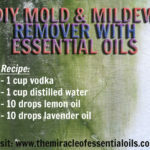 Into your spray bottle, add 2 tsp of olive oil followed by the essential oil. Now swirl the bottle gently to combine the essential oils into the olive oil. 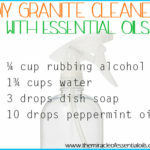 Pour in the distilled water then add 1 tbsp of liquid castile soap. Shake very well to combine. To use, spray on the surface then wipe off with a soft microfiber cloth. Shake well before every use. Ta-da! Squeaky clean and sparkly surfaces! 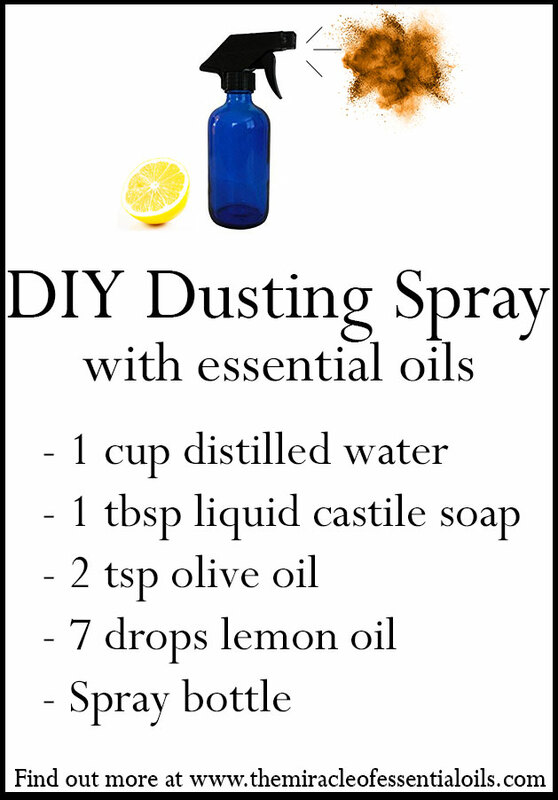 Keep this DIY essential oil dusting spray away from children and pets.